Challenge: Often times when a Deaf student is at the high school level, they have been using the language for so long that they are very fluent in it and great storytellers using their language, sign language, yet they still struggle with putting that great ability into a written form. This is where this next lesson idea can be a helpful tool. Most students have times where they have to do reports, such as a report on a famous person or present an argument/cause. They can do a good job at the research part, and can even tell others about all the information they have gathered and learned about, but converting that into written word is still a struggle. Allowing the students to put their knowledge first into a video format is very beneficial because of this. It allows the students to use sign language that is rich in dramatic expression to convey their thoughts and knowledge without limiting them to the English words that they may struggle with. Have the students make a video first, then use the video as a guide to translate the ASL presentation into a great written paper. This idea allows for freedom to communicate in a Deaf student's own language, without stifling their creativity. It also allows a very teachable moment for you as the teacher to help translate their signed words into written expression, with the ability to start and stop and revisit if needed. The end product will be an amazing expression of the student's actual knowledge and creativity...and a lot of fun too! As a reference, you may want to refer to the English Language Arts Standards for Grade 6-8, Grade 9-10, and Grade 11-12, many of which could be intergrated into this assignment. Of course both the video and the paper are excellent tools to send home to help foster communication between school and home. 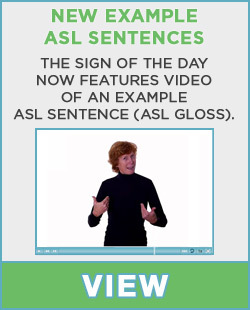 You could even send the video home and have the parent help their child in translating the sign language into written English. That way, both the student and their parent will teach each other and learn a lot along the way. What a great idea! This probably would also be useful with some learning disabled hearing students as well. In my opinion, when you are writing a research paper first thing you should do is choose the topic( the good source for it could be chemistry research paper topics) or else when you do not know the topic, you will not know what exactly you want. This idea builds on the concept that at this age, what these kids like best is to hang out, be a part of a cool group and talk about things that are of interest to them. What better time to have them create their own newspaper! This will allow the students to choose topics of interest to them, which hopefully will also allow them to have more comfort in their writing. Because of the high interests and feelings of confidence surrounding the topics the students will also feel more comfortable sharing this writing with others which is an important part of writing - publishing! You may need to be push the students at times to venture into areas out of their comfort zones as well, but once the ball gets rolling with a class newspaper, it will take on a life of it’s own. One purpose of this project remember is to improve communication between home and school as well, so topics and articles should be something that the student’s parents and families will also enjoy reading. Once students complete their paper, have them practice a presentation of their paper at home with their parents before presenting in front of the class. This is an opportunity for the student to share sign vocabulary from their paper that maybe their parents wouldn’t know. There are many topics that the students would like to cover that may not be common vocabulary in their home settings and this assignment is a great opportunity to increase everyone's vocabulary at home. Have students and parents use Signing Savvy as a resource to expand and understanding new vocabulary for the assignment. We have many signs on Signing Savvy and continue to add more all the time.